Romney’s drawings are so boldly handled and freely brushed that it might seem impossible to reconcile this aspect of his practice with that of his work as a painter of formal portraits. Romney is generally ranked third in importance among British portrait painters of the 18th century after Sir Joshua Reynolds and Thomas Gainsborough, and while it is not unfair to criticise his painted portraits for a certain monotony and conventionality, he was one of the most prolific and compelling draughtsmen of the British school, emerging through his drawings as an artist of exceptional imaginative vigour. Romney came from northern England where he received his early training before setting himself up as a painter in the town of Kendal, and then London in 1762. Although his great aspiration was to succeed in the lofty art of history painting, rather than mere portraiture, and create pictures in the Grand Manner as advocated by Sir Joshua Reynolds, president of the newly founded Royal Academy, Romney never became a member of that institution nor exhibited there. Nonetheless, his interest in history painting resulted in huge quantities of drawings in which he explored ideas for imaginative subjects from literature and history, but these never materialised into finished pictures. In 1775, after his return from Italy – where he had spent a couple of years furthering his artistic education – Romney quickly set about establishing a lucrative practice as a leading society portraitist, installing himself in a chic studio with attached picture gallery in London’s Cavendish Square. Here an endless parade of fashionable clients beat a path to his door. As a matter of course Romney conducted between three and six sittings per day, and his sitter books contain records of some 1500 individuals who commissioned portraits from him. 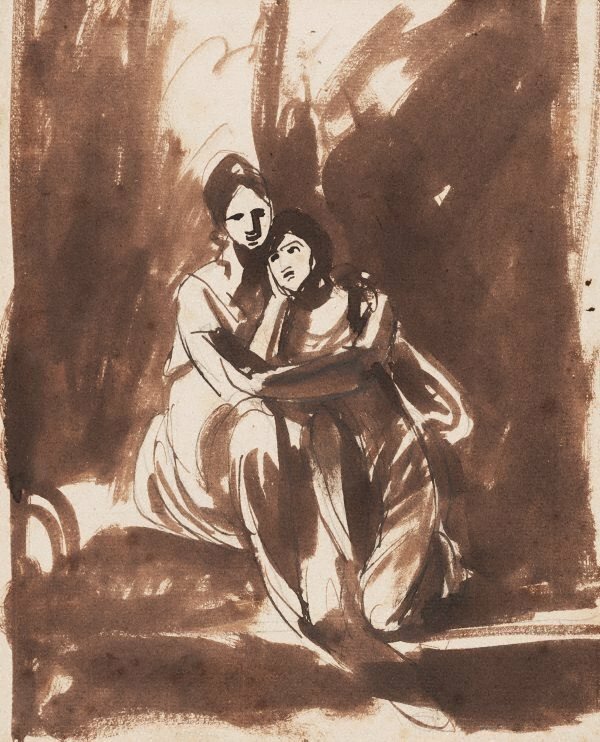 The captivating sheet shown here is a preliminary sketch for the painting titled The Milner sisters (sold Sotheby’s 27 June 1973, present whereabouts unknown). The painting traditionally has been thought to depict Louisa Sarah and Henrietta Maria, two of the six daughters of Sir William Milner, 2nd Baronet (c1725–74), and his wife, Elizabeth Mordaunt, however there is no evidence to prove this identification. Despite the copious studio records that Romney left behind, there is no mention of the Milner sisters having sat to him, although it is possible that the girls sat anonymously as ‘two ladies’. Stylistically, the Gallery’s drawing can be dated to the late 1770s, by which time Romney did not often bother to make preparatory studies for society portraits, yet the existence of a second, more Neo-Classical, study in the Cecil Higgins Art Gallery in Bedford, suggests that Romney viewed the commission as one worth taking trouble over. In the finished painting much of the emotion of Romney’s original idea has been sobered. By contrast, the daringly simplified drawing – rapidly and confidently brushed in brown wash with minimal use of outline – captures not only the intense bonds of sisterly love between the sitters, who are posed in a deeply shaded woodland grove, but also suggests the more intangible natural sympathy that exists between the girls and the landscape. Romney was still working out a solution to link the two bodies; in their embrace the two arms are not fully distinguished and it is as if the girls share a single limb. His pose for the presumably younger sister suggests wistful adoration, and the effect of filtered sunlight on the girls’ faces and dresses contributes to the extraordinary feeling of warmth, informality and tenderness.